Description: I really had to zoom in on this unit therefore its a little grainy. Description: Southbound At Race St. With Long Train! Description: At bridge at CP Kase. Description: Crew confers, probably wondering when their cab is going to arrive. Description: Meet near CP Horn. Description: Conrail Blue leads a NS local on the A&S trying to get through Lenox Tower. Description: NS 5344 (ex-CR) GP38-2 on an NS local. Description: NS (ex-CR) GP38-2 5344 heads a short military move with NS 3182 trailing. Description: NS Southbound Local Freight Train AB10 doing some switching on the high line at 14th Street Interlocking in Birmingham, Al. Description: NS 5344 is heading back into the Decatur yard. Train is running the old IT trackage. Description: An ex Conrail GP38-2 brings in a short train passing outbound mixed freight NS 301. Description: NS 5344 leads a eastbound freight with an Ex-UP unit (now NS) and another NS unit into East Wayne yard in New Haven. Description: Norfolk Southern #5344 leads NS local D28 up the Yankeetown Branch towards Boonville. 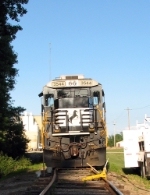 At Boonville, NS local D14 will take the cars to Huntingburg to be put on a manifest freight.